CERRO® products are low melting temperature alloys used as thermal fusibles for forming or temporarily fixing parts. They are used in applications such as eyewear, the manufacture of spatial parts and aeronautics. 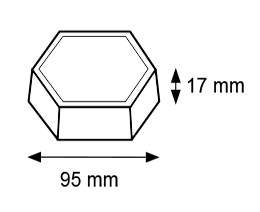 The METACONCEPT Group offers a range of specific alloys whose melting temperatures, guaranteed by the precise composition of the alloy, provides the behavioural change required (solidus/liquidus) in safety systems or when forming parts in industrial or medical fields. These products are supplied as bars or small ingots; they can also be manufactured in the form of sticks, flat bars or large ingots. Fusible alloys undergo dimensional changes (expansion/shrinkage) depending on the casting and cooling time. Generally, fast casting with a cooling time of less than 15 minutes optimises stability. The METACONCEPT Group collects used baths,off-cuts, scraps and white metal oxides. Contact our recycling department to find out more. 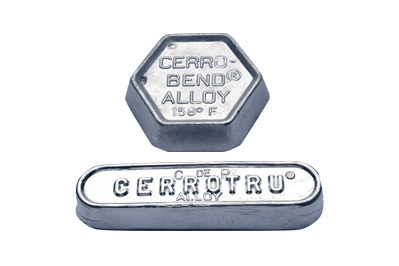 CERRO® alloys are non-ferrous, bismuth-based alloys with low melting temperatures. They are made exclusively from high-purity primary metals. They are unlikely to rust and can be reused or recycled. All other fusible alloys (temperatures between 38°C and 227°C) are available on request: such as alloys from Wood’s metal and Arcet’s metal. The METACONCEPT Group also manufactures small fusible parts for thermal purposes according to specifications. The implementation method is specific to each workshop and depends on the alloy and its application. In all cases, the metal needs to be placed in a crucible. Bring the temperature of the alloy to 20°C above the temperature of its liquidus. You can then pour the molten metal into the mould prepared for this purpose. Let it cool, taking into account possible expansion or shrinkage. After use, the alloy may be re-melted and reused. If this application is repeated frequently, it would be wise to contact the METACONCEPT Group so that they can conduct a metallurgical analysis and potential purification. Indeed, contaminants such as metal from the mould and oxidation from the surrounding air could slightly alter the composition of the alloy. Contact our technical department to ascertain which product is most suited to your application. Group will not be held liable for it.